Served at room temperature, this is surprisingly good in the light of the current heatwave: sweet and moreish, but slightly tart and refreshing. Served warm, it is excellent comfort food. One of Holloway's many treats are the fruit and veg stalls that sell entire bowlfuls of plums for £1. This batch proved too many to eat so I decided to make crumble from the surplus (and gradually overcoming my fear of making desserts in the process). Serve with a dollop of sour cream or ice cream if you fancy a little creaminess with the fruit. First, preheat the oven to 180° C. Then quarter the plums, discarding the stones and peel, core and slice the apples into 1cm pieces. Toss the fruit layer ingredients in a large bowl before transferring to an approximately 30cm oven-proof dish. To make the crumble, whizz the ingredients together in a food processor until the mixture resembles fine crumbs and just starts to cling together in nibs. Take care to stop the motor before the mixture turns into a dough.Alternatively, you can do this by hand, massaging the butter and flour mixture together until you have crumbs. Again, if you knead too long you will end up with dough, so don't overdo it! 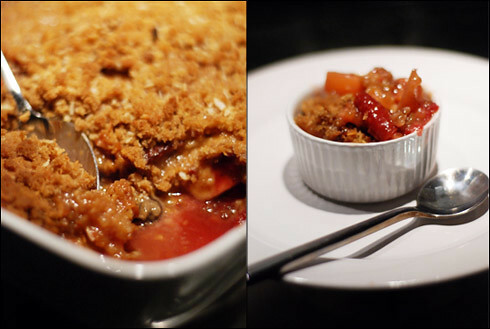 Sprinkle the crumble over the top of the fruit filling, cover with foil and bake in the oven for 45 minutes. I usually take the foil off 15 minutes before the crumble is ready to gently brown the crumbs a little. Leave to cool for 10-15 minutes before serving, or at room temperature.